As a youth, I studied Russian for 4 years because I wanted to read Dostoevsky in the original. But it will be a while before I decide to take my tourist Franks to Putin's sad kingdom. 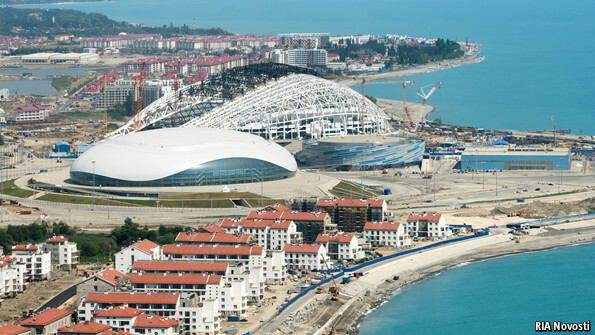 Today's Economist published a bluntly honest article about the construction currently underway for the Sochi 2014 Olympics. "The whole place resembles nothing so much as a Communist-era construction project. Cost, efficiency, nature and human lives never stood in the way of Soviet rulers who reversed Siberian rivers, built cities in permafrost and planted corn in virgin land—often to ruinous effect. In scale, Sochi 2014 is similar, yet the amount of public money it will cost makes Soviet projects pale in comparison." What present-day Russia lacks in sophistication and high-tech, it makes up for with huge numbers (70,000) of (mostly) unskilled laborers without safety training, contracts or insurance, who are being paid miserable wages (if they are paid at all!) for round-the-clock 12-hour shifts. "Large construction projects often have a side-effect of corruption. But in Russia corruption is not a side-effect: it is a product almost as important as the sporting event itself. The quality of the work is patchy. The ski jump has been redone many times, and the cost has risen sevenfold. Newly laid sewage pipes have burst, so a nasty smell drifts over a kindergarten playground. Sea-coast fortifications cracked soon after installation. The work has been carried out with little concern for the environment. The river flowing into the Black Sea has been polluted by construction waste and protected forests have been cut down. A green whistle-blower was prosecuted and chased out of Russia." It is a travesty that the IOC awarded the Olympics to Russia in the first place. I hope the world press will not dignify this sporting event with legitimacy by glossing over the unappetizing bits once the show starts.